This is your final chance to register for our 2017 Spring Symposium in New Orleans, because registration closes Friday, April 21, at 11:59 PM EDT. An opportunity for professionals to earn up to 20 CEUs, this program will be diverse, in-depth, and timely, with sessions led by first-class presenters and plenty of networking opportunities with your peers. We hope that you’ll join us in the Big Easy! We're excited to announce that we hope to see you next year in Austin, Texas, May 20-23, 2018! Registration will soon open, so stay tuned for more information! A Few More Food & Farm Tour Registrations Remain! There are only a few spots left, so plan to come early and be one of 25 on a private journey through one of the world’s great food scenes! Add a day to your Today’s Dietitian Spring Symposium stay and enhance your experience with this special and intimate look at the local food scene in New Orleans. This fun and information-filled event will give you an opportunity to observe highlights of the local food, farm, and hunger organizations in New Orleans. 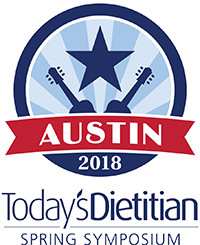 Led by Sharon Palmer, RDN, you will have the opportunity to gain access to a personalized tour of local venues, as well as taste local, seasonal food prepared by an award-winning chef. This continuing education course discusses the observed links between obesity and asthma and examines the potential impact of weight loss on asthma control in adults and youth. Buy 2 Courses, Get One FREE! Food and farming expert Michele Payn’s book, Food Truths from Farm to Table, is an evidence-based examination of food myths across nine sections of the grocery store. In this thought provoking and practical book, the author provides strategies that dietitians can use to assist clients in avoiding confusion in the grocery store.